The East Region has a full slate of matches lined up across all four conferences this week. The East Region has a full slate of matches lined up across all four conferences this week. Several teams, including the entire Metropolitan conference, will begin their 2018 seasons. Action begins on Wednesday with the lone midweek fixture, and continues with a packed weekend of soccer on Friday. Penn Fusion SA will play its first match of the season against the Philly Fever on Wednesday. Philly Fever enters with a win and a loss, good for third-place in the Mid-Atlantic Conference table. Last season, Penn Fusion finished second in the Mid-Atlantic Conference on tiebreakers, with an impressive 8-1-3 record. Kickoff is scheduled for 7 p.m. EST at the Penn Fusion Turf Field. On Friday, the month of June begins with an Ohio Valley Conference fixture between the Empire Revs and Cincinnati Sirens FC. Both clubs are still looking for their first wins in 2018. Kickoff is scheduled for 7 p.m. at Lakota West High School in Cincinnati. Saturday’s events begin with Legacy W76 traveling to Virginia to take on Old Dominion Cesena USA in the first match of 2018 for the latter. Legacy W76 opened the season with a scoreless home draw against Virginia Beach City FC, while Old Dominion Cesena USA is set to make its debut in the Colonial Conference. Kickoff is scheduled for 1 p.m. at Freedom High School in South Riding, Va. The action continues later in the afternoon in New York, with newcomers SUSA FC hosting New York Athletic Club in the first Metropolitan Conference match of 2018. This match is the first of two this weekend that sees one of the oldest WPSL clubs, New York Athletic Club, taking on an expansion club. Kickoff is scheduled for 4:30 p.m. at Bayport-Bluepoint High School in Bayport, N.Y. The first of two Ohio Valley Conference matches on Saturday sees Indy Saints FC traveling to Pittsburgh to take on Steel City FC. Indy Saints are new to the WPSL for 2018, and will make their league debut in this match. Kickoff is scheduled for 5 p.m. at The Ellis School in Pittsburgh. The second Ohio Valley Conference match on Saturday features AAFC Lumberjills hosting the Cleveland Ambassadors. 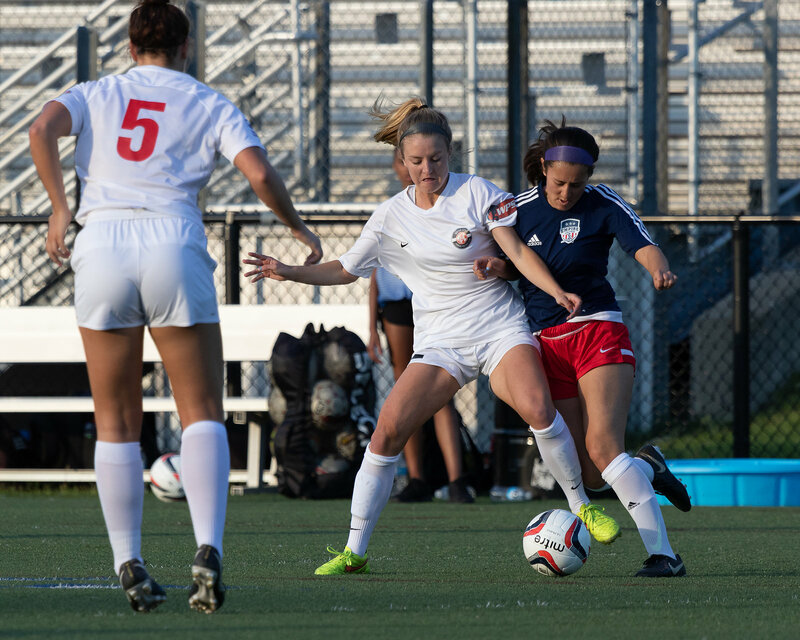 The Lumberjills are fresh off their first WPSL win, 3-0 over the Empire Revs, while the Cleveland Ambassadors drew 3-3 against the Columbus Eagles last weekend. Kickoff is scheduled for 6 p.m. at Concordia University Ann Arbor. Metropolitan Conference action continues with the Rhode Island Rogues making their WPSL debut as they host the NJ Wildcats. The Rogues are the women’s counterpart club in the Providence City FC organization. Kickoff is scheduled for 6 p.m. at Providence College. The final match on Saturday will see the Lehigh Valley Tempest hosting Penn Fusion SA. Lehigh Valley currently sits in first place in the Mid-Atlantic Conference as the first team to two wins. Kickoff is scheduled for 7 p.m. at Cedar Crest College Falconplex in Allentown, Penn. Sunday kicks off with the Ohio Valley Conference, with the Empire Revs hosting Indy Saints FC. The Revs might feel their schedule is a bit tight, but Indy has a turnaround of less than 24 hours to travel from Pittsburgh to West Henrietta, N.Y. This does allow the possibility for the Indy Saints to make their WPSL debut with six points in under a day. Kickoff is scheduled for 3 p.m. at the Empire United Soccer Complex in West Henrietta. The Long Island Fury are set to begin their 2018 campaign on the road in New Jersey against the NJ Wildcats. The Wildcats are one of many clubs set to play on both Saturday and Sunday, and they will have played in two of the first three Metropolitan Conference matches of the year. These two clubs finished just one point apart in 2017, with the Wildcats edging out Long Island for third in the conference. Kickoff is scheduled for 3:30 p.m. at Manahassett Creek Park in Long Branch, N.J.
Philly Fever is set to return home to host Hershey SC. Both clubs finished level on points in 2017 with 13 each, and Hershey is still looking for its first win of 2018. Kickoff is scheduled for 3:30 p.m. at VE Club Warminster in Warminster, Penn. Penn Fusion SA will play its third match in five days when it hosts Torch FC in the first of several matches between clubs in the Philadelphia metro area. This match, like the two above it, is scheduled for 3:30 p.m. at the Penn Fusion Turf Field in West Chester, Penn. The Washington Spirit Reserves will get their 2018 season underway as they travel to Virginia Beach to play Virginia Beach City FC. Virginia Beach remains undefeated, simply because its only match played ended in a 0-0 draw. Though, as the Colonial Conference is the smallest in the WPSL with four clubs, each point is vitally important. Kickoff is scheduled for 4:30 p.m. at the Virginia Beach Sportsplex. Just 24 hours after making their WPSL debut, the Rhode Island Rogues will play their second match, hosting New York Athletic Club. New York Athletic Club is a longstanding WPSL veteran with over a decade of play, and this marks the second match for them against expansion clubs this weekend. Kickoff is scheduled for 6 p.m. at Providence College. The final match of the weekend features two Ohio Valley Conference clubs off to hot starts. Columbus Eagles FC, who rallied to claim an incredible 3-3 draw in Cleveland will host Motor City FC, fresh off a big win at home. A win for Columbus could leave them as much as ten points clear of Cleveland, while a win for Motor City could put it firmly in second place in the conference. Kickoff is scheduled for 7 p.m. at Otterbein University in Westerville, Ohio. That wraps up the upcoming week in the WPSL’s East Region. The next week will begin on Thursday, June 2, with two midweek matches ahead of yet another packed weekend of elite women’s soccer.